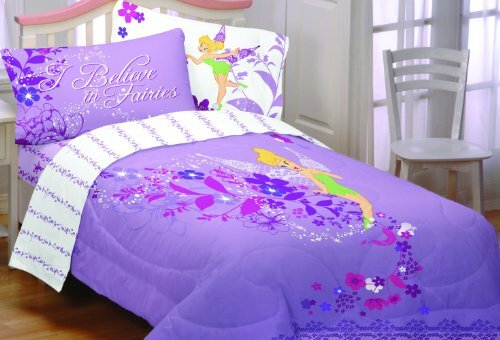 Get wonderful bedroom accessories and decor for your little fairy. A Tinkerbell room makes a magical and special place for a girl for daytime play and the sweetest night dreams. What a super cute bedroom theme Tinkerbell and her Disney fairy friends make for toddler rooms, kids rooms or even adults who simply can't get enough of that amazing pixie dust magic! If you want to create a really great fairy themed room, check out the large wall decal stickers you can now get because that is a really easy way to introduce this scheme with professional looking results. This fairy makes some of the best bedroom decorations for fans of pretty pinks, lilacs and blues. Let's see how to create a beautiful space that any fan of this little fairy from Peter Pan will simply adore! If purchasing a full set of bedding is going to work out to be too expensive, simply choose a large blanket or bed throw (there are some great ones further down this page) and you can use that over any existing bedding that you have already or over plain bedding. 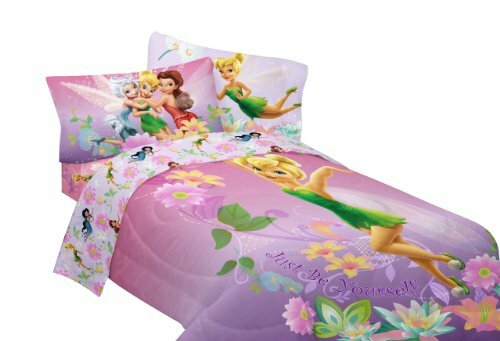 It's very hard to get hold of bedding sets for cribs with this Disney Fairy design. The bedding is widely available for toddlers and older children. If you're handy with a sewing machine, then you could always purchase for a toddler size and make your own crib set out of it. This is what I did when I made a strawberry themed scheme for my daughter. I couldn't find a baby set so I made my own crib bumper and comforter from a larger one. This themed room doesn't have to be all pink or all lilac. You can pair up pinks with other colors such as creams or sky blue. And lilac will team up well with pale greens. Some people deck out bedrooms for fans of this fairy purely in blues, just like the colors in an early evening sky which also looks wonderful. Work out a color scheme that you like and buy suitable bedroom decor to match. As the bedding can often work out to be the most expensive item, why not work the color scheme around this. Or you might want to start with a key piece of furniture to get your inspiration with instead. You can quickly get the right look in a room by simply adding some wall stickers or decals to the bedroom walls. Wall decals are easy to remove and also reposition if you want to place them elsewhere. This is important if you ever move furniture around in the room because you can then move the stickers too. Wall stickers are much easier to decorate with than old-fashioned wall borders or wallpaper - oh my goodness can that be a pain when you want to redecorate and get it off! The special stickers are easy to take off and they do not leave a mess on the bedroom wall - they peel off cleanly and easily. Should you prefer the idea of wall decoration which is more permanent, then you can also look for paper borders which you can use instead. 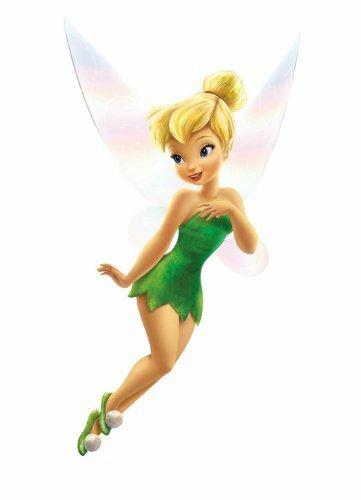 The RoomMates Giant wall decal features a large sticker of the Peter Pan fairy which has gorgeous glitter wings. This feature is so pretty and just like the magical pixie dust that she loves to sprinkle around! It's around 27 x 30 inches once assembled which is pretty much the size of a decent poster. 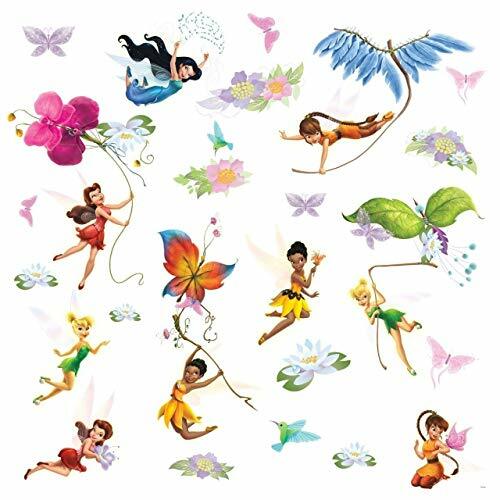 For a smaller scattering of Disney fairies, including little Tink, how about the RoomMates Disney Fairy decals? You could sprinkle these stickers around the bedroom walls to add a touch of magic. And did I mention that these also have pretty glitter wings too? The Blue Mountain wall stickers are a 3 piece set with Tink, a beautiful lilac flower decoration and a quote which reads 'Kick up some Pixie Dust!' It's a very cute sticker set which would look gorgeous in a lilac or purple themed fairy bedroom. 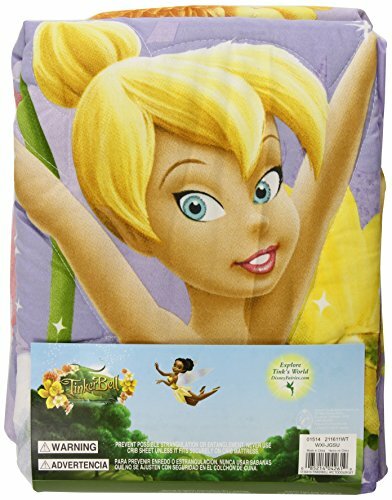 This soft and warm microraschel blanket features tinkerbell. A plush, warm and snuggly addition to a fluttering fairy bedroom would be a blanket or throw. Blankets and throws can be used as an extra warming, top layer on a bed to keep a child cozy even in the middle of those cold winter months. Old or plain color bedding can be livened up quickly and inexpensively with the addition of a throw or blanket which features these characters. You can certainly save some money this way by just getting a throw to match the bedroom decor rather than the complete bedding set. Blankets and throws can be used to breathe new life into other items too. How about using it on top of a child sofa to match it in with the room. We've used them to hang over tables and also as front covers over bookshelves or open face shelving which looks untidy. You can even hang them from a pole to make some quick wall art! To cover the front of a bookshelf, sew up the blanket to the right size. If it isn't big enough to cover the whole unit then sew it to the middle of a larger piece of fabric first. You then want to stick or sew some large velcro fastening to the top back of this blanket and also stick the other piece of velcro to the top of your bookshelf. You can now easily attach your Tink blanket cover over the entire front of the bookshelf which looks pretty and keeps the bedroom looking super tidy too. So many young kids love to have little night lights left on while they sleep. Some children are naturally afraid of the dark while others, like my own daughter, just find it rather comforting. Night lights help kids to feel secure and also safe at night-time. There's also the practical side of night lights too. They leave a light source that is dim enough not to waste much power but bright enough to use so kids can visit the bathroom safely without tripping over anything on their way. I love this little lamp with lilac shade. Tink is in a magical garden, admiring all the flowers. At the press of a button, she can dance and sway to the fairy music too. This is more than just a bog standard lamp, it's a lovely feature too. Kids think it's great because the music is quite loud but parents love the switch which turns the sound off! A decent wall clock which can be seen easily and quickly is very useful for parents and adult carers. Perhaps much more interesting than for kids who normally are not bothered what time it is at all - except when it is bedtime and then they wish the clock wasn't there because they want to stay up for just '5 more minutes!' Having a clock in your child's bedroom really helps you to keep track of the time so you can see when it's time to wind down the play and get on with the putting to bed routine. When kids get older, clocks can be used to help them learn to tell the time. A clock with visible numbers and hands makes this a lot easier to do. My daughter learned what all of the hours were using her bedroom clock. Having a clock with a digital display is great for kids who can read numbers but can't get the hang of a traditional clock face. School age children might prefer an alarm clock so they can start getting themselves up in the mornings. This helps them to act more independently and children love to be entrusted with a little more responsibility for themselves. There is so much decor that you could get for this theme. I love the idea of a little pixie picture frame which can be used to keep a kid's photo in. Most kids love to look at themselves - it isn't really vanity but more a curiosity. You could also keep a photo of someone your child adores but doesn't see often inside so your child can keep them close by. The lilac toddler bed is really cute. You could get matching bedding too but you really don't need to because the bed itself is pretty enough. I love the fact that it has safety panels which you can remove as and when you need to. How sweet too are these lilac curtains which looks like the fairies are flying up into the sky. I hope you've enjoyed reading my wizzles page today, thanks for your visit. These would finish off the bedroom beautifully and add to the magic. Definitely - not everyone can sew but you can do so much mire if you can with home decor. Thanks for your visit. Very pretty bedroom items, kinworm. Good thing even naughty little fairies can change their behavior. Thank you, Jimmie. 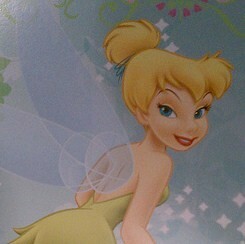 My daughter's favorite book is Peter Pan - she loves Tinkerbell, Peter Pan (the boy who never grows up) and the Pirates! She noticed that Tink was not particularly nice in the book (compared with the Tinkerbell movies) and I explained that she's got better as she's got older! So she's been christened Naughty Tink in Peter Pan! Adorable bedroom theme! A child would dream of flying around London with Peter Pan with a bedroom like this. You know, Tink's personality has been somewhat reinvented. She was quite mean in the original book and Disney movie. Jealous, vengeful, spiteful. I mean, I like her spunky character from a literary perspective. But I wouldn't want my daughter to emulate her behavior. The Disney Tinkerbell Snowglobe is a really cute globe to collect. Fairy snowglobes are ideal as keepsake gifts for newborns or little girls who love fairies and Peter Pan's Tink. 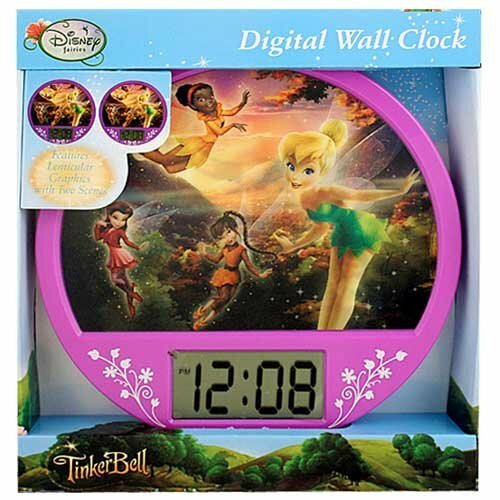 Here's a fab selection of Tinker Bell gifts for kids and adult collectors too with this handy guide on keepsakes, toys and more. She's the sweet Disney fairy from Peter Pan.